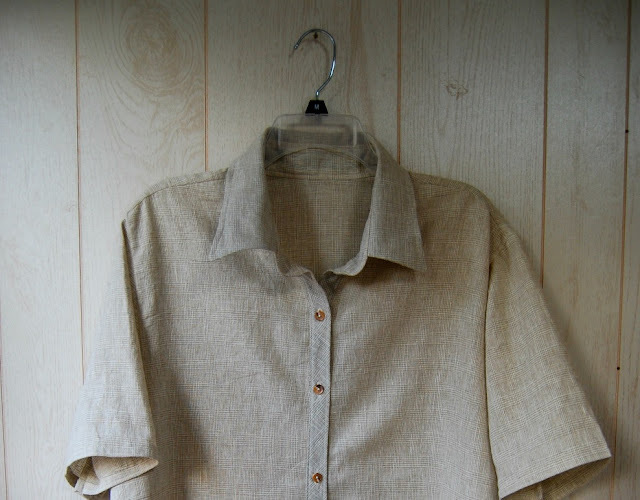 This version is absolutely identical to the teeny baby button down I made earlier this summer. After I made the little version, J commented on how much he liked the fabric. I liked the fabric, too. I would call it a cotton gauze, though it was just labeled as a cotton shirting at the fabric store. It's two very fine layers of cotton sort of fused together in places. When you wash and dry it, it puckers up. Could it be some sort of seersucker? It's supposed to be wrinkly, but in these photos it's extra wrinkly from traveling. Neither one of us felt like ironing anything on vacation. The only downside is that it does need a really good pressing out of the wash or the fit is noticeably smaller. I used McCalls 6044 again. This time I cut a L instead of an XL. I didn't make any changes except sewing the armscye seam in another 1/4". 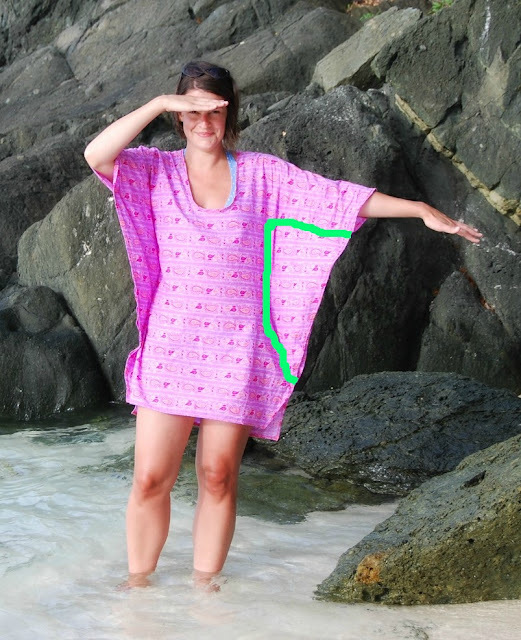 The shoulder seems to sit very wide on this pattern. I still think they are a tiny bit wide. J is happy with the fit on this shirt, but I think there could be just a 1/4" to 1/2" more width through the belly. Just a teensy, tiny bit more room. I notice that he pulls it there when he puts it on. It could also be that the crinkly fabric is clingy. 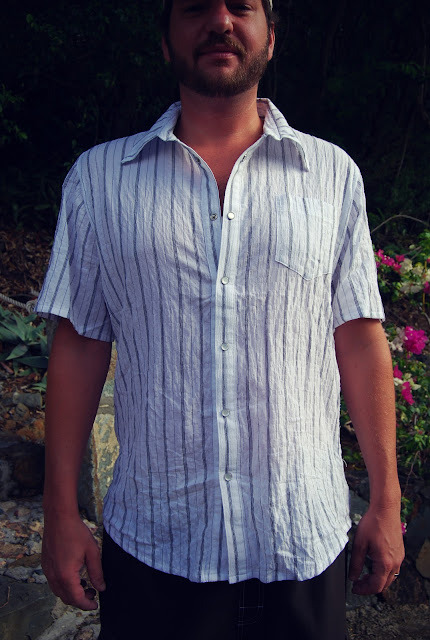 I kept the original shirttail hem on this version, which I like. I also swayed J into letting me use pearl snaps again. I love pearl snaps! I must make something for myself with them. It doesn't really pull at the snaps like in the photo below. I think that must have been an awkward pose. It's hard to make your husband pose for fifty photos from all different angles. Although I'm pleased that he even posed at all. I'm much happier with this second go at making J a shirt. It was definitely easier the second time around. I knew what to do and what to look out for. Matching the stripes was tricky, but I think they match everywhere it counts. I will definitely continue to make J shirts now that I've got a pattern that he likes. Of course making J shirts will be spread out between selfish sewing. Of course. 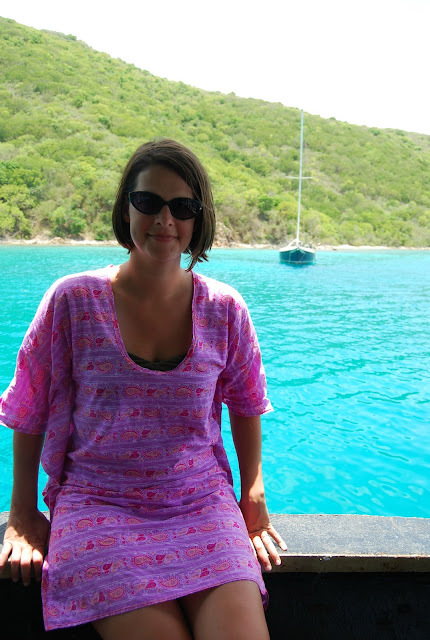 I wanted to make a cover up to wear over my swimsuit while I was in St. John. And I wanted it to be an elegant, flowy, bohemian looking caftan. I wanted to swan about and sip on drinks with little umbrellas. So I flipped through all my old Burdas and settled on this pattern- number 134 in the 05/2011 issue. It's actually a plus size pattern. But I altered the width of the pattern through several different changes. When I was sewing it up, all I could think of was little old ladies in muumuus. The smallest size was a 44, which is not really that far off from what I usually use in Burda. I normally trace a 40. 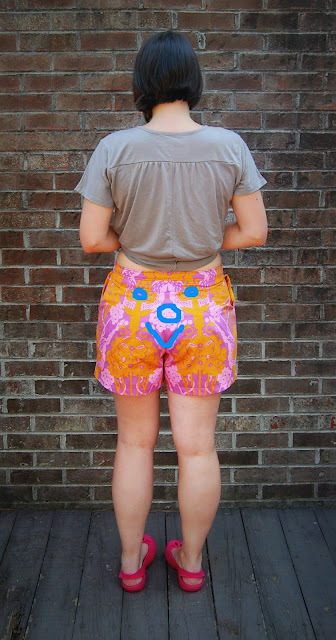 And the shorts I made recently were actually a 42. So I figured I didn't have far to go to make it less shapeless, though the pattern is meant to be somewhat shapeless anyway. I skipped the underskirt. Not necessary for a cover up. I traced the pattern pieces exactly as is and did not add seam allowances. I also ended up having to piece the front together, which took another 1 1/4" of width (you can see the seam in the photo below). And since I was looking for a quick and simple sew, I left off the facings and omitted the center front and back seam. Instead of facings, I scooped out the neckline and bound the edge with bias. I'm not super happy with the binding job. It sort of flips out, but it was definitely easier than adding facings. And who wants facings on a beach cover up anyway? And since I no longer had a v-neck, I cut the front and back on the fold. I was facing a really strong wind in the photos above. The right one makes me think of a Michael Jackson video for some reason. I look like I could fly away. J giggled a bit at my cover up but I was pleased with it. All the other photos were taken after spending the day on Hawksnest beach. I could seriously hang out on the beaches in St. John all day long. 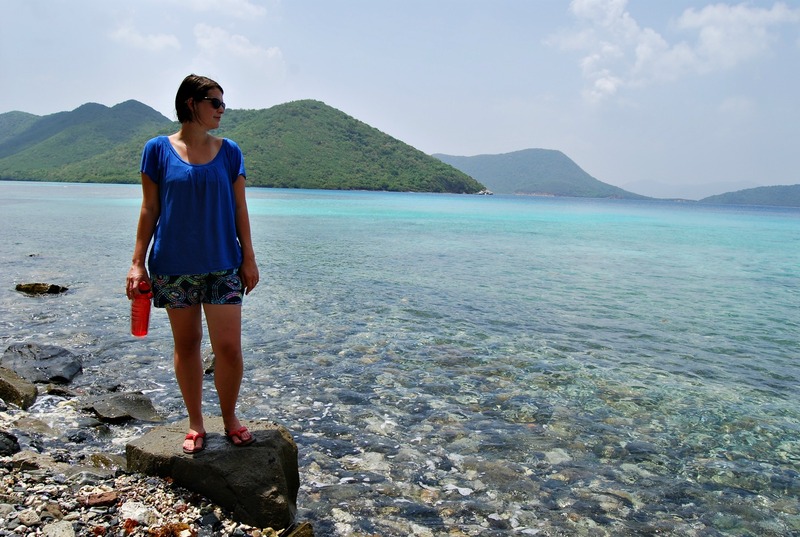 Geez, these photos make me want to go back! With all the changes I made that affected the width, I should have realized that the straight underarm and side seam stitching would not have worked as is. I sewed the original stitching line as marked, but couldn't fit it over my hips. So I changed the stitching line so it stopped at the waist and moved towards the side seam at an angle around the hips. See my incredibly dodgy attempt at showing the new stitching line below. I think it worked pretty well, imo. 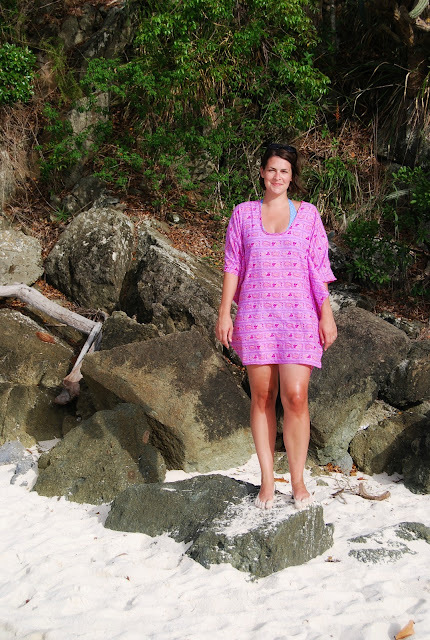 It was a perfect cover up and I wore it several times in St. John. 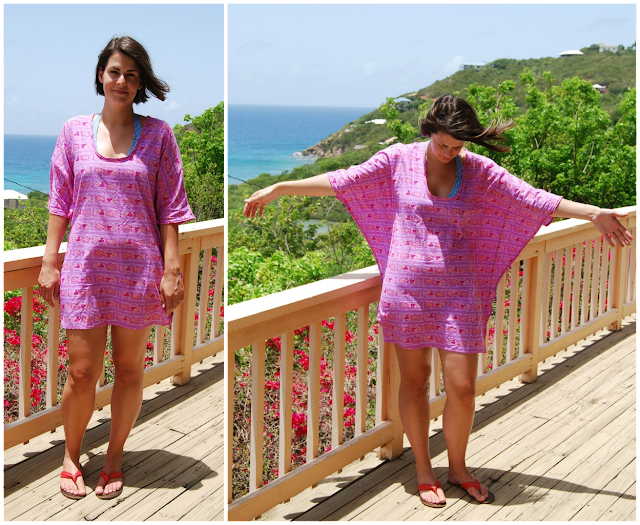 I used a very pink cotton lawn (or is it voile?) from my stash. The fabric made the caftan/muumuu cool and breathable while also keeping most of me out of the sun when I needed it. The only other change I made to the pattern was to shorten it considerably. The original length hit just above my knee. I chopped off about five inches in length, leaving the back about an inch longer than the front. It was a quick project, especially after making it just two pieces. The only part that took time was hemming the curved side edges. So what do you think? Would you call this a caftan or a muumuu? I'm not really sure. I think maybe those little old ladies are on to something. On a side note, I am having so much trouble getting back in to a routine now that I'm back at work. We got back from our vacation and I had about 24 hours to rest before I went to work at my new school. And it's been craziness around here ever since. I know I've missed lots of awesome blog posts by you fantastic folks out there, but I'm catching up. And I haven't picked up a needle or thread since I've been back. Yeesh. Not to be too whiny, but you know. I feel whiny. Hopefully I'll be back to reading and commenting like my old self soon. 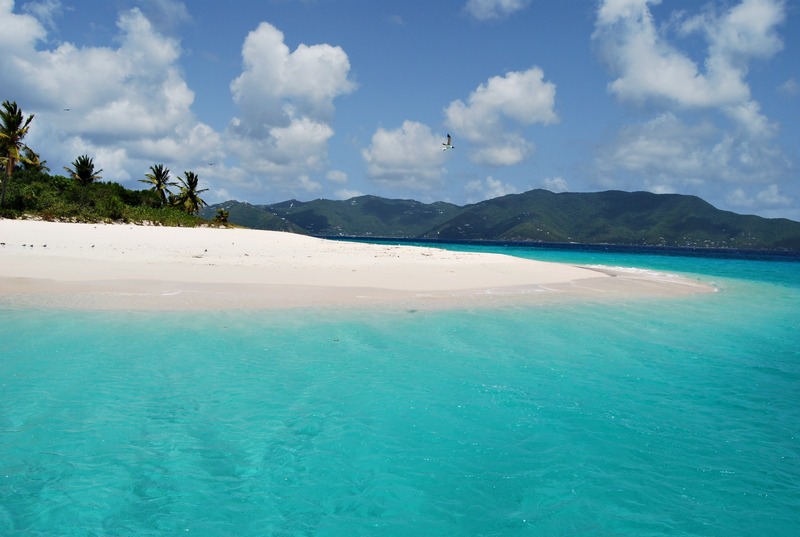 Sandy Cay, BVI's. The colors in this photo have not been edited at all. 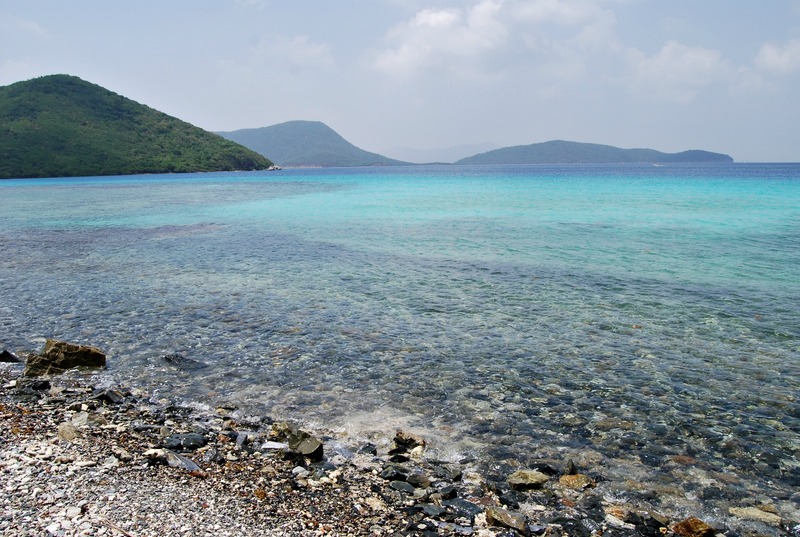 That is actually the color of the water in the Virgin Islands! This is a gratuitous vacation post, just in case you're only interested in the sewing posts. Though there were lots of handmade things worn in St. John. I went in to a sewing frenzy before we left. I think I sewed a grand total of six different items for our trip in the last two weeks before we left. To tell you the truth, I was a little drained by the time I was done. I was frantically finishing a dress late at night before the morning we left at four a.m. Anyway, I'll post about the things I made later on. This is just a summary of what we did, what we saw... mostly for me to look back on more than anything else. And yes, maybe to be a little bratty, too ;) It sure was a beautiful place. The shorts came in handy! I wore both pairs multiple times. They were great for all the beach going and hiking around we did. We did so much walking, swimming and snorkeling everyday that we were worn out at night. I think we went to bed around nine every night. One more time, Waterlemon. The water here was absolutely insane. Again, not edited. We rented snorkel gear the first day we were there and took it everywhere we went. You could just walk in to the water, put on your mask and go. The snorkeling was amazing. I've never seen anything like it. 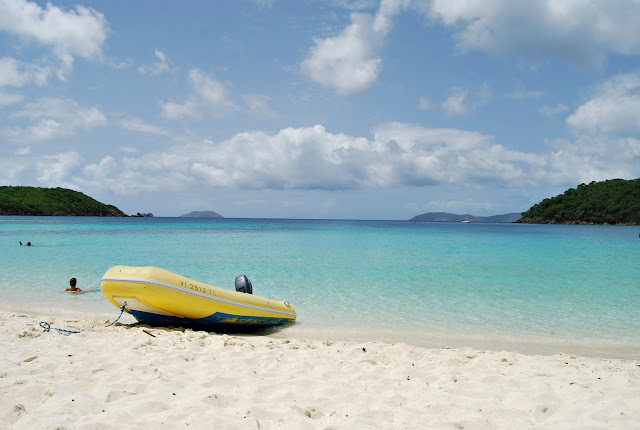 The first day we were there, we went to Maho Bay. J was in the water for five minutes and popped up screaming, "Turtle!" I'm sure we didn't look dorky at all. We followed about five or six sea turtles as they leisurely munched on the sea floor for the next hour. It was pretty amazing. All the beaches on St. John are public. 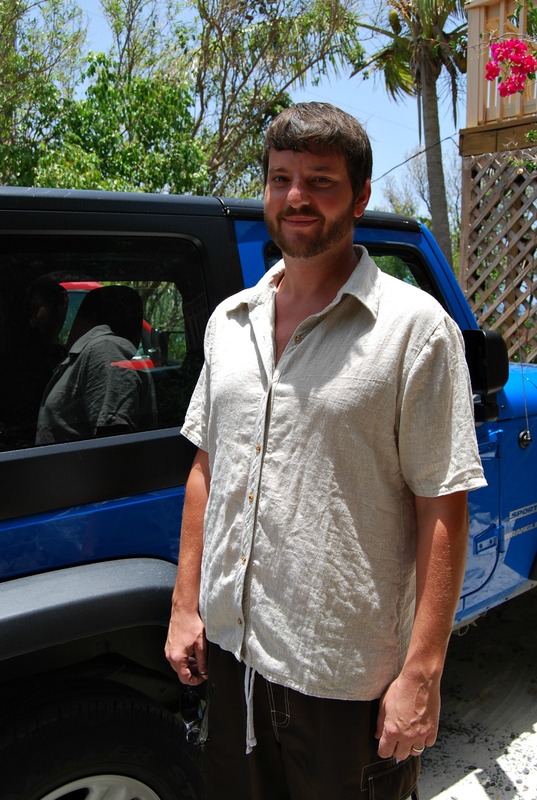 We rented a Jeep for the week and traveled around the island going to a different beach or two everyday. They were all beautiful. I'd have to say they are some of the most beautiful beaches in the world. 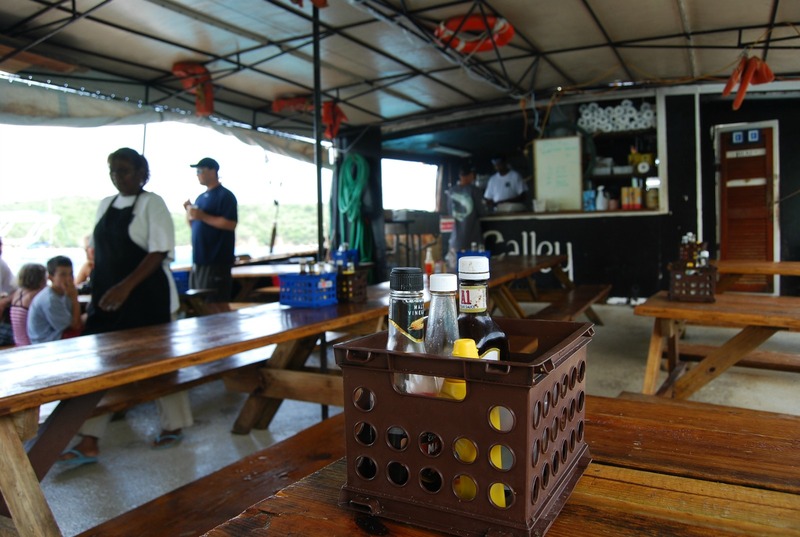 We went to Maho, Waterlemon, Salt Pond, Hawksnest, Trunk Bay, and Jumbie. I'm absolutely spoiled rotten now. 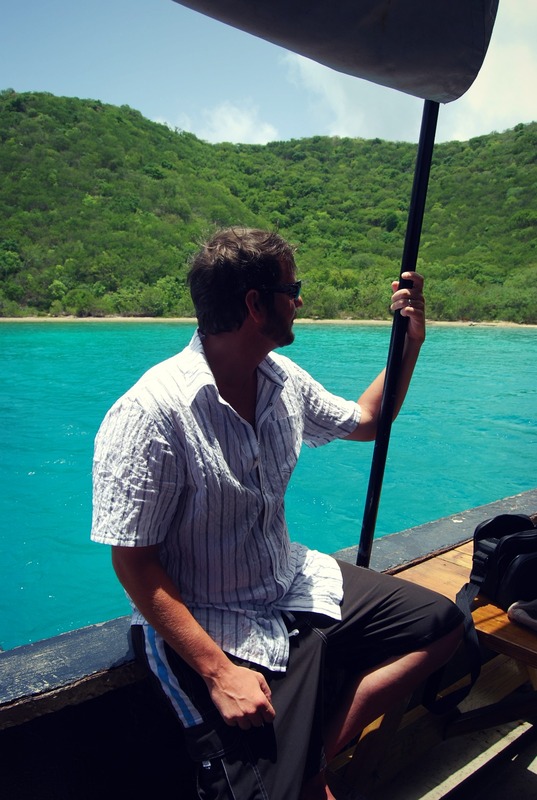 The last day we were there, we chartered a boat and trolled around the British Virgin Islands. 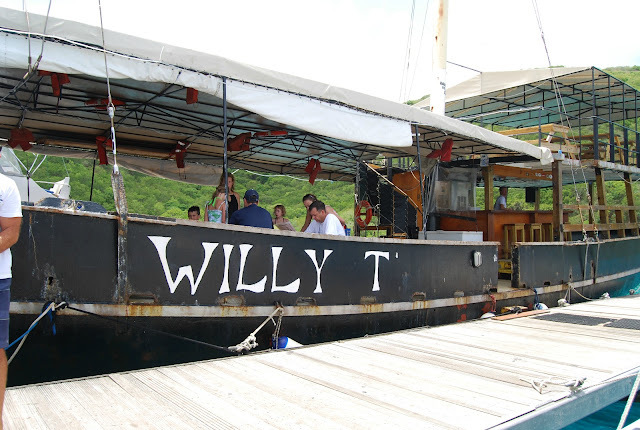 We stopped for lunch at Willy T's. It's a boat in the middle of the ocean that serves as a bar/restaurant. And the food was really good! So were the drinks. In addition to Willy T's, we snorkeled at the caves at Norman, stopped at Sandy Cay and swam up to The Soggy Dollar Bar on Jost Van Dyke. My best pirate impersonation. And I made that cover up-- to be blogged soon. The boat trip was probably my favorite part of the trip. Actually, I don't know if I can pick just one favorite part. It was all pretty awesome. 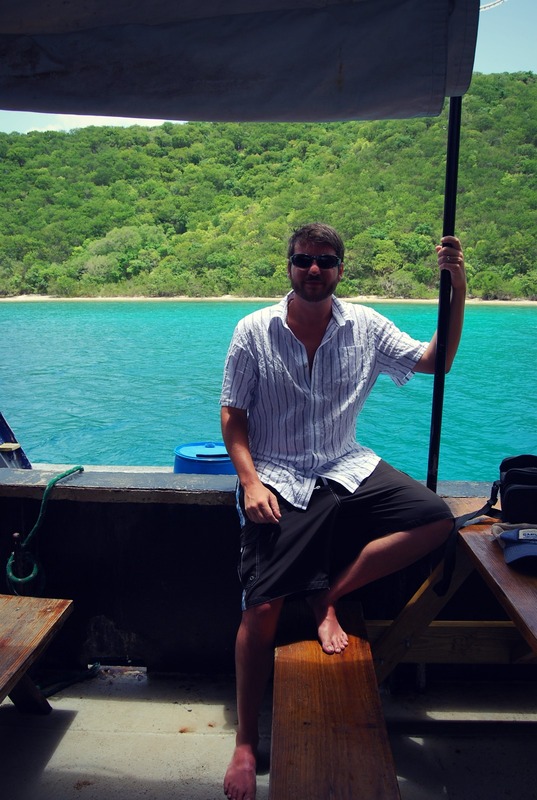 If you ever have a chance to make it to St. John, do it. It was absolutely unreal. We had such a great time. 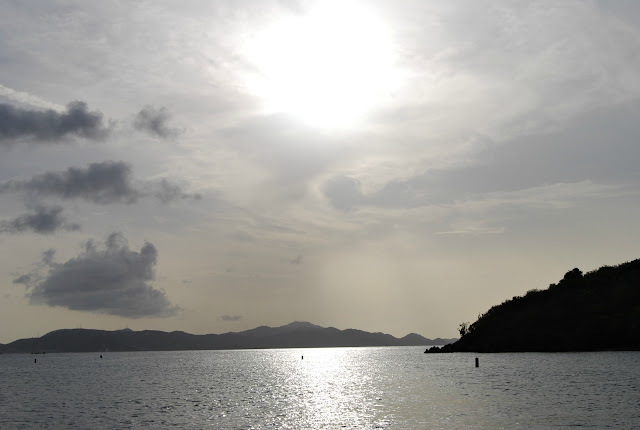 Until next time, St. John! A few weeks ago, I was hanging out with some friends and they asked me what I was working on. I mentioned that I was getting ready to sew a shirt for J, after promising him one for a couple of years now. One friend, apparently struck by the thought said, "Hey! Do you remember that episode of The Cosby Show where Denise made Theo a shirt?" I swiped this photo from an Oona Does It! on The Sew Weekly. When I read that post last summer I instantly remembered it from my childhood. 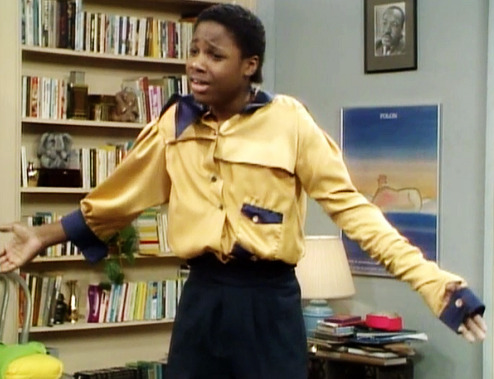 And it may be, hands down, the best episode of The Cosby Show ever. I highly recommend watching it. I love The Cosby Show. I'd much rather watch old Cosby reruns than anything else that's on TV today. That makes me sound old and crotchety, doesn't it? Now let me start by saying that J deserves a shirt. He really does. I have been telling him I would sew him a shirt for a very long time. The only thing I've ever sewn for him is a pair of fleece pajama pants (which he wears quite often, thankyouverymuch). But for the most part, I sew selfishly. It was time that I made the man a shirt. So I pulled out McCalls 6044 and decided to give it a go. I thought to myself, "How hard could it be?" I've seen so many before me make fantastic men's shirts. 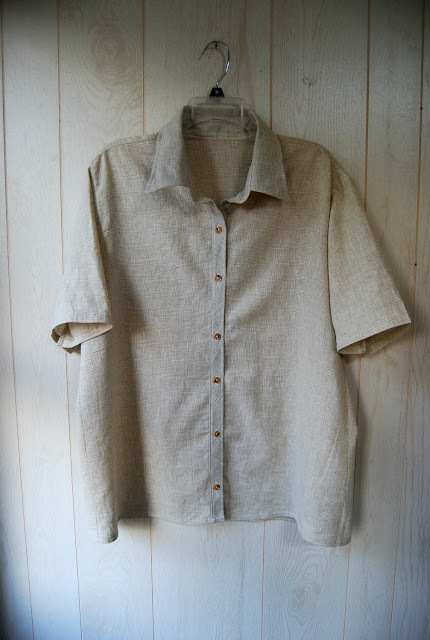 There was even a men's shirt sew along a while back I could refer to. I was sure I could pull it off. Um, to quote Clair Huxtable: "Oh Denise, shirts are not that easy to make!" The shirt I made did not turn out as bad as Denise's. In fact, it looks decent. It was a decent attempt. My sleeves are most definitely the same length ("My arms are the same length- why aren't my sleeves?" Bwahaha!). And my collar is put on well thanks to Peter. But just wait for it. My first mistake was choosing the wrong size. I cut out an XL but really I could have gone down a whole size- or more. 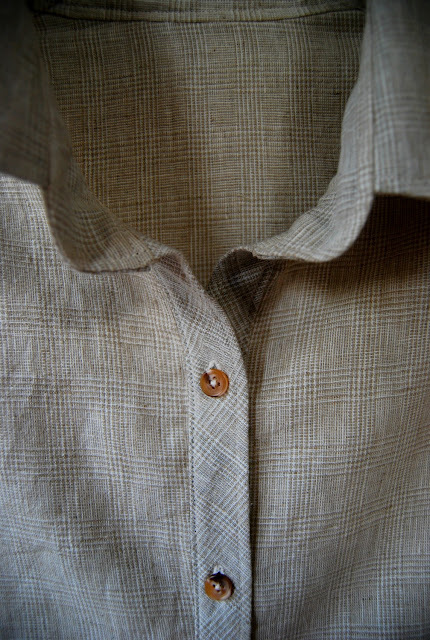 I used a very loosely woven linen with a very subtle plaid woven in. The linen is really nice but it proved to be difficult to sew. It was one of those wiggly linens. I sewed the shirt together at the shoulder seams and attached the placket and collar. Then I basted the sleeves and side seams and we proceeded to do some fittings. Actually, we did FOUR fittings. J was initially swimming in it. I took in all the seams, made all the pieces smaller to make it work- except for the collar which was already attached beautifully. I wasn't removing the collar. I had to bring the sleeve seam up almost an inch on each side so it was actually in the vicinity of his shoulders. There were numerous instances of basting and adjusting. J also had some requests. This is a man that demands perfection in everything he does. He makes perfect tipis, he finishes furniture impeccably, he paints the most beautiful portraits of me (I'll have to show you some of his paintings sometime) and he married the perfect wife. Just kidding on that last one ;) He's pretty picky. But I knew that going in. He wanted shorter sleeves, narrower sleeves, a specific length and no curved hem. It was a long process. By the time I was nearing the end, I just wanted to be finished. I had a couple of hours one day to sew all the basted seams permanently, make the buttonholes and attach the buttons. I was ready to get back to sewing for myself. I actually did it while he was outside working in the yard. When he came inside, I had the shirt hanging up and a very smug look on my face. J went to check it out and all I heard was, "What's up with the buttons?" We both had a good laugh. Well, J laughed right away. It took me a couple of hours before I laughed about it. Normally I measure and place buttonholes myself. But since I wanted to be finished, I used the pattern piece that has the buttonholes already marked. I laid it on the placket and drew a line under each marking. Somewhere along the way the pattern piece must have shifted. And I have a little, er, variation in spacing. Rats! I shouldn't have rushed. If there was ever a more perfect red flag that says, Hey someone MADE me this shirt!--- this is it. I know, I know. It's truly not that noticeable at first. But once you see it, you can never un-see it, if you know what I mean. He says he'll wear it anyway. But I know how much it will bother him and his need for perfectness. So I won't push the issue. And just so you know, I briefly thought about removing the placket and redoing to buttonholes but decided it would be easier just to make a new shirt. Which I did. Which is much better. And you better believe I measured those buttonholes obsessively this time around. I'll get pictures of the new shirt on our vacation. Ok, so they are not super short or anything but this is a big step for me. I have not worn short shorts for several years now. I feel silly for saying this, but I haven't worn shorts because as I got older and more, um, well-rounded, I always thought my legs looked funny. I've always had big legs, this I know. But really? I can wear short shorts. My legs are totally normal. One positive of snapping so many pictures of myself over the last couple of years is that I have a much healthier image of myself. Hope that doesn't sound too self-centered, but if you take photos of yourself you know what I mean. This is what my legs look like. And they are just fine. They take me where I need to go. Ok, enough of that. Feel free to laugh at my fabric choices. I'm kind of giggling myself. I'm not sure why I chose such wacky fabric, but I did. I know these will not be everyone's cup of tea. I also don't blame you if you are laughing at my hot pink crocs. I love them, but I try not to wear them in public. Well, maybe I don't try too hard. 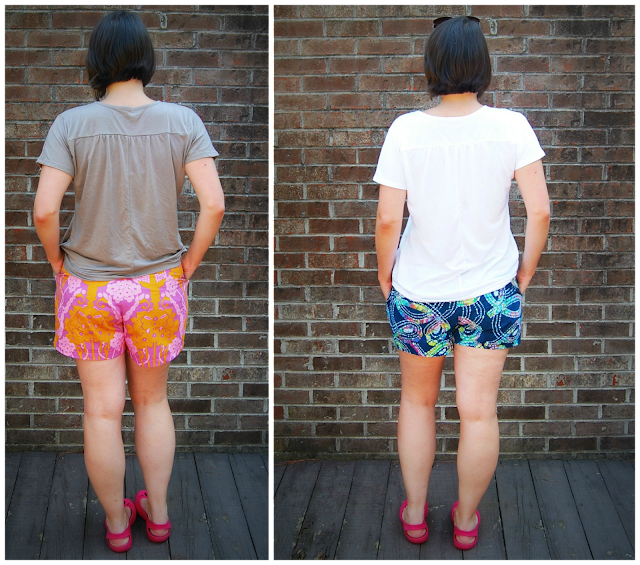 I made up both pairs of shorts from the Burda 6-2011 issue, number 111B because J and I are going to the Caribbean for a week before I go back to school. I'm so excited! 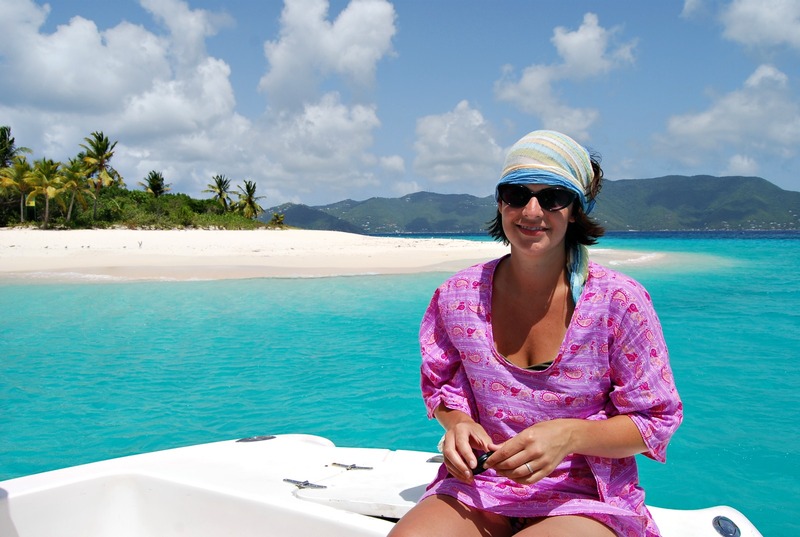 The only plan we have is to lie on as many beaches as possible, snorkel, drink fruity drinks and generally act like pirates. I can't wait. 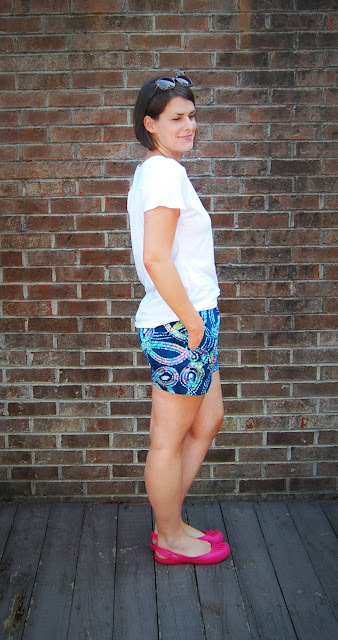 These shorts fill a void in my wardrobe as I don't own any pair other than athletic shorts. I think they'll be perfect for traipsing around a tropical island. 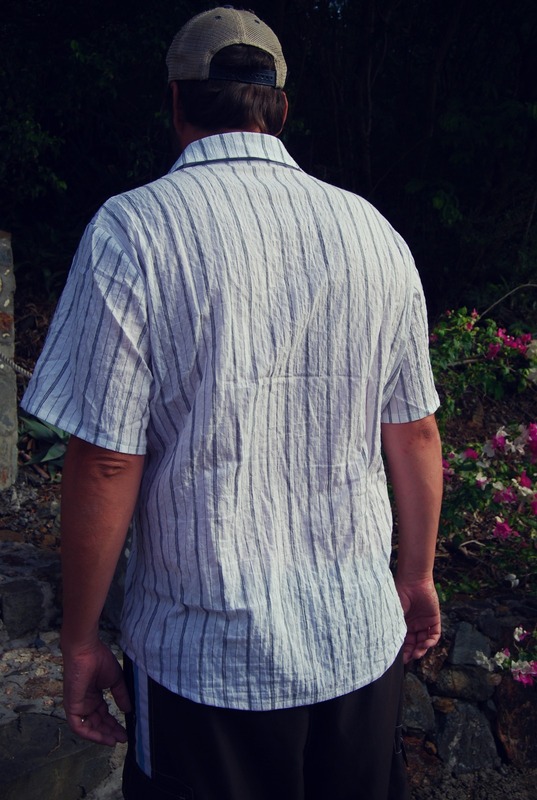 I chose this Burda pattern because it is simple. No fly front, just an invisible zip at the side. I figured it would be a safe bet for a trial pair of shorts. I even left off the back pockets as I didn't want to have to worry about pocket placement. This was an experiment. 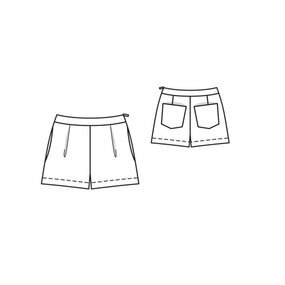 I've always heard about how wonderful Burda's trouser block is but I've never made a pair of pants or shorts from a Burda pattern. But now I'm a believer. The fit is not perfect, but it is SO MUCH BETTER than both the Simplicity and Butterick patterns I've tried. One observation between this pattern and the Big 4 patterns I've tried is that there is a lot more width in the back pieces compared to the front. So Burda makes trouser patterns for people with butts. I consider the blue batik pair to be more of a success than the crazy orange and pink pair. I actually made the blue pair first. Are you tired of batiks yet? Well, sorry. I had a small one yard piece of this batik from Hancock and I was happy to use it up. The waistband is different by accident. Don't decide to make a Burda magazine pattern when you are in a hurry. 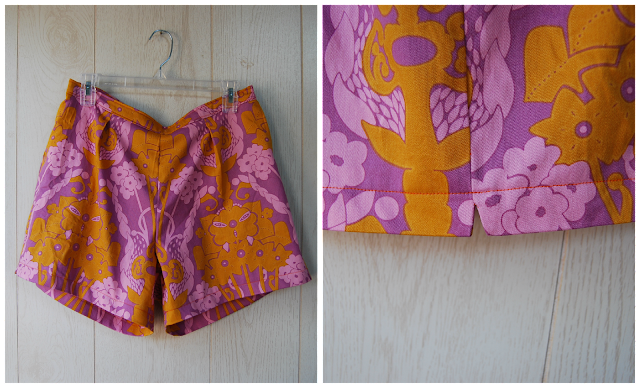 I had a limited amount of time to sew when I made these and I was determined to finish. I traced off the front, back and side seam pockets and cut out my fabric right away. Then I settled in to sewing like a banshee before I realized I missed the waistband pieces. The navy polka dot fabric was lying on my sewing table and I was struck by how well it matched. So I cut the waistband from it. As I was cutting the waistband I had a moment of clarity where I realized I had not added in seam allowances on the other pieces I cut. D'oh! It worked, but just barely. I think I'm pretty generous with my sizing most of the time. I give myself some room for mistakes because I figure I can always take it in. Anyway, I won't ramble on. Long story short, they fit but I didn't want to lose any length. So I also cut a hem facing from the same polka dot fabric. I like the little bit of weight it gives to the hem. I did not pay one lick of attention to the instructions thinking that I knew better. I didn't. I put in the zip before I added the waistband (I put the zip in around a pocket, I might add ;) so my zip doesn't reach the top of waistband. I made two button loops and threaded some cord elastic through to make the loops stretchy. I actually think the stretchy loops are what make the waist fit better on the blue pair. Hooray for elastic. After all my screw ups and fixes on the fly, I figured I owed it to the pattern to make it up right. So the pink pair of shorts are made properly; with seam allowances and following instructions. They are okay. A little too baggy, a tiny bit too long and there is a little bit of difference in the way the crotch fits. The wrinkling at the front crotch is definitely more prominent on the pink pair. But wait... is that a side seam split? Why yes it is. Thank you very much, Sherry! :) I'm so excited to know how to add this fun little detail. You may see this here quite often now. I'm not sure what my other options were. They'll suffice for a Caribbean vacation whilst wearing a long tee. I'll be sure to have a fruity drink for you.